(January 30, Colombo, Sri Lanka Guardian) The wheels of ‘justice’ of this government certainly grind extremely fast when it is moving to punish those whom it sees as its sworn enemies. True, this country’s past has had its share of instances where the law was manipulated to serve the cause of political revenge as was the case famously when the late President JR Jayewardene moved to deprive his arch rival, one of the country’s premiers, the late Sirimavo Bandaranaike of her civic rights. But it must be admitted that for sheer outrageousness, very little equals the actions of this administration in putting the country’s former Army Commander, a decorated and much acclaimed war hero by the government itself at one time, behind bars, evoking sympathy for his plight even on the part of those who had little reason to like the man when he was at the height of his military authority. This week’s decision by the Supreme Court sets the seal on the disqualification of the former Army Commander continuing to sit as a parliamentarian in its interpretation that a court-martial comes within the meaning of ‘any court’ as detailed in Section 89(d) of the Constitution. This provision disqualifies a person to sit and vote as a legislator if such person is serving or has, during the period of seven years immediately preceding the election, completed serving a period of imprisonment for a term not less than six months after conviction by any court. The question was, of course, whether a court-martial came within the definition of ‘any court’ as contemplated by this constitutional provision. The core of the case for the former Army Commander was, among other factors, that appointments to courts-martial are ad hoc, they are not bound by the Evidence Ordinance or the Code of Criminal Procedure, their determinations are limited to military matters, their decisions need to be certified by the executive for validity and they do not observe principles of fair trial. Consequently, a court-martial does not come within the meaning of ‘any court’ in terms of Article 89(d) and the former Army Commander is not disqualified as a legislator. Shorn of the complexities of legal interpretation and discussion of the continuance of pre-existing laws as a result of Article 16(1) of the Constitution, the judges (unanimously and quite simply) appear to have been persuaded by the argument of the Attorney General that if the contrary was to be held, then a ‘logical absurdity’ would arise. This would be that the legislature may then comprise of persons actively serving prison sentences or/and languishing in death row awaiting execution at the instance of the executive upon being found against by a court martial. In so holding that verdicts of courts-martial would come within the disqualification stipulated by Article 89(d), there is very clear judicial insistence that the relevant constitutional provisions should not be read in a vacuum but must be seen in their totality. These judicial opinions remain to be extensively discussed in other fora (and it is hoped), would be subjected to rigorous analytical and academic comment. However, there is no doubt that at first blush, the inclusion of a court-martial within the meaning of ‘any court’ in terms of Article 89(d) of the Constitution carries with it, several immediate inferences. 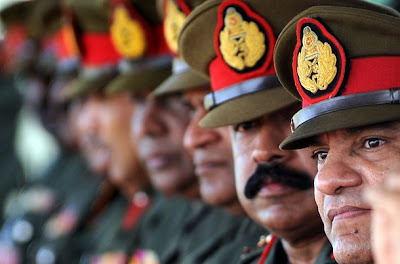 Even though it is obviously to be accepted that a court-martial is a legitimate instrument of inquiry in terms of the Army Act, its independence from political control is not as easy a question to answer. Though one may strain at the very fibre of one’s being to argue that a court-martial functions as independently as a civil court, this is manifestly not the case. Seen from a contrary perspective of the trial of military personnel for human rights violations, the lack of independence of courts-martial is precisely the reason why international law has preferred not to accept the mechanism of a court-martial as a legitimate vehicle of inquiry for grave human rights violations. This standard embodies, at its heart, the principle of legality and equality before the law. In issue here is the warning that such military courts will be biased or prejudiced in favour of military officers in absolving them of human rights violations. This fear comes from the fact that the guarantees of independence that (even nominally)underpins a civilian court, does not operate in that same way before a military court. If one extends this same logic to trials by a court-martial of military officers who have offended the political executive, (even though the context may be vastly and indeed ironically different from instances of grave human rights violations committed by military personnel), that same absence of independent judgment applies in full force. This is further buttressed by the fact that such verdicts require certification by the executive itself in order to come into force. Applying this reasoning to the situations contemplated by Article 89(d) which sets out the disqualifications to sit and vote in Parliament, the practical effect would be that courts-martial will sit as equal as independent courts acting within the confines of the separation of powers and will be treated in exactly the same way when constitutional provisions are in issue. The consternation of the Supreme Court in envisaging a situation where ‘persons actively serving prison sentences or/and languishing in death row awaiting execution at the instance of the executive upon being found against by a court martial’ may be enabled to sit in the House, may be understandable. Yet this reasoning has implicit in it, judicial acceptance of the fairness of such courts-martial as well as subsequent processes of certification of their verdicts. This acceptance may therefore be subjected to contested opinions. Cumulatively however, it is to be hoped that a deafening silence in the public fora on the part of commentators and analysts would not follow this week’s judicial opinions much akin to what we saw in 2006 when former Chief Justice Sarath N. Silva’s unprecedented judgment declaring that the First Optional Protocol to the International Covenant on Civil and Political Rights was contrary to Sri Lanka’s Constitution, was handed down. Restrained and considered comment on decisions of the courts of this country should be a part of our public consciousness as much as is the case in India, Pakistan and other countries in this region. This is how we exercise our full rights as citizens and abandoning those rights can only be to our collective peril.